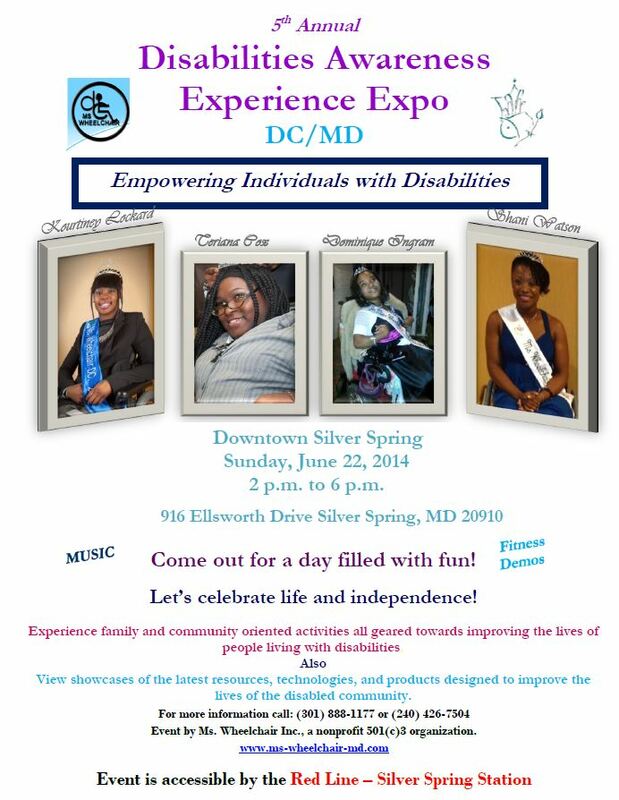 We are planning our 5th Annual Disabilities Awareness Experience in the beautiful Downtown Silver Spring at 916 Ellsworth Drive, Silver Spring, MD on Sunday, June 22, 2014 from 2:00pm to 6:00pm. Our goal is to unite communities and organizations for the purpose of raising awareness, and support meaningful inclusion of people with disabilities and their families in every aspect of life. The Disabilities Awareness Experience brings awareness and education to all individuals regarding disability resources, prevention and education, healthy and independent living, and recreational resources. Ms. Wheelchair Maryland would like to invite you and your consumers to join us. As a important member of our community we would be honored to have your presence at our event. We are all striving to make people aware of the challenges that are faced with individuals with disabilities. See you there!